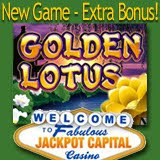 JackpotCapital.com has just launched the all new Golden Lotus slot machine and is featuring it as one of its “Games of the Month” for March (along with Lucky 8s and Jackpot Cleopatra’s Gold), which means double comp points for players. The US-friendly online casino, which is famous for its massive million-dollar jackpots, is also doing a free bonus raffle each weekend in March in addition to its usual huge deposit bonuses. The new Golden Lotus is a deluxe 5-reel, 25-payline slot machine that takes players to an enchanted oriental garden where a treasure lays waiting to be uncovered. There are lots of opportunities for free games where prizes are 3x, 4x or 5x. In the Chinese Garden bonus feature there are even chances to win 100x the bet. Like Triton’s Treasure, the last new slot machine launched at JackpotCapital.com, Golden Lotus has two jackpots, a Major Jackpot that starts at $1000 and a Minor Jackpot starting at $250. Triggered at random, both increase with every bet until they are won. Earning its name, JackpotCapital.com is home to the biggest progressive jackpots available online to US players. At over $1.6 million, the Jackpot Pinatas jackpot is the largest jackpot available, but two other jackpots have also reached seven-figures. The Aztec’s Millions jackpot and the jackpot tied to both the Mid-Life Crisis and Shopping Spree slots both all well over $1 million. In addition to the usual creative promotions, Jackpot Capital is doing another exciting thing this month. Players can enter the contest and interact with other JackpotCapital.com players on the recently-launched casino’s Facebook Page, which has over 500 fans (http://www.facebook.com/pages/Jackpot-Capital/391828100507).